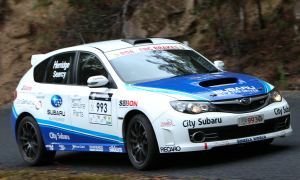 It’s been one of those days for Dean Herridge at 2012 Targa Tasmania. After a better than expected opening day, the first stage of day 2, Rossarden, provided disappointment. Meanwhile, the other Maximum cars has trouble-free runs today. In the 4WD Showroom class John O’Dowd maintained his 5th place, while Graham Iddles moved the #985 Seibon Carbon Subaru up into 18th place. Tomorrow the crews head out on the long journey to Strahan, on the Tasmanian west coast. A day earlier than on previous years, leg 3 includes the fast Cethana stage, the tricky Hellyer Gorge, and concludes with the long Rinadeena stage in Strahan. This entry was posted on Thursday, April 19th, 2012 at 10:19 pm.